Stores lined up along Sherman Avenue in downtown Evanston. Some local business owners expressed doubts about a proposed bill that would increase the minimum wage to $15 an hour. Local officials and business owners had mixed reactions to a bill in the Illinois House that would raise the minimum wage from $8.25 to $15 an hour by 2022. The effort is part of a national campaign to raise the minimum wage; similar legislation has already been passed in California, New York and Washington, D.C.
For Evanston, the push for $15 in Springfield takes place against the backdrop of a recently enacted Cook County ordinance. The ordinance — passed in October 2016 — will raise the minimum wage for employees over 18 to $13 an hour by 2020. Municipalities may choose to exempt themselves under the principle of “home rule” if they wish. Several municipalities — including River Forest, Schaumburg and Rosemont — have already opted out, choosing not to raise the minimum wage. Evanston mayor-elect Steve Hagerty said he supports the effort, emphasizing that changes in the minimum wage should first come from Springfield. “I feel very strongly that working people need a livable wage, and that needs to be implemented on a state level,” Hagerty said. Cook County commissioner Larry Suffredin, who sponsored the minimum wage ordinance in Cook County, said he also supports the bill. He added that one of the goals of the Cook County minimum wage hike was to prod Springfield to take statewide action. Suffredin said a higher minimum wage is for the public good, even if businesses have to make some sacrifices. A higher minimum wage would mean higher consumption, Suffredin said, as people living below the poverty line tend to spend immediately rather than save. Hecky Powell, who owns Hecky’s Barbecue in Evanston, disagreed with Suffredin. Powell said he is preparing for the ordinance by freezing hiring, cutting back on staff and training his current employees to take more and different kinds of work at the restaurant. In addition, Powell said he would have to cut back on health care. Powell attributed attempts to raise the minimum wage — both in Cook County and on the state level — to politicians’ lack of business experience. Powell said he was interested in exploring an effort to get Evanston to opt out of the minimum wage ordinance. Local businessman Larry Murphy also said he was skeptical of a higher minimum wage. Murphy, who owns YoFresh, said though big corporations may be able to pay higher wages, local, small businesses run the risk of financial ruin. He added that a minimum wage is only one component of what employers pay on behalf of their employees, citing Social Security benefits and health care. Murphy, who is also the lead organizer of the Black Business Consortium of Evanston/Northshore, said many of the consortium’s members would have similar concerns. The legislation, which was re-referred to the Rules Committee on Friday, seeks to address those doubts by providing tax credits for small businesses to compensate them for some of the lost profit. These credits would start at 25 percent in 2018 and gradually decrease to 5 percent in 2022. Suffredin dismissed the concerns raised by Murphy and Powell as a common “knee-jerk reaction” he’s heard while working on minimum wage issues. “If a business is so fragile that it can’t sustain the increases that we’re talking about, then it shouldn’t be in business,” Suffredin said. Ald. Judy Fiske (1st) also said she supports the minimum wage hike, and has previously supported the Cook County ordinance. Fiske said though she didn’t know the specifics of the bill, she had campaigned to raise the minimum wage during the last election and won. 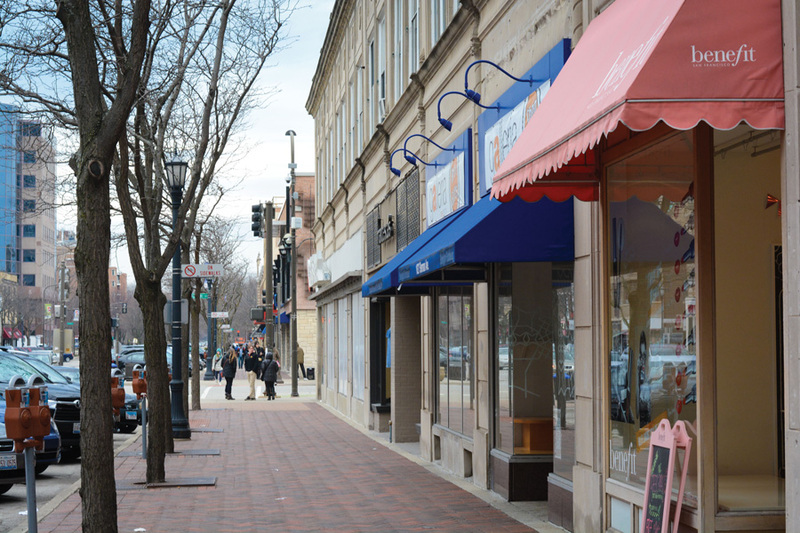 Fiske’s ward, which contains many of Evanston’s businesses, would be one of the most affected by a higher minimum wage. Fiske said the business owners in her ward have responded positively to the idea. “We need to talk to more business owners, but so far the only ones I’ve heard from are people in support,” Fiske said. Jessica Donnelly, who owns Unicorn Cafe in the 1st Ward, said she supports an increase in the minimum wage because the current one is not livable. Donnelly said she is not worried about the potential impact of rising wages on her business.